· Sneezing over and over again, especially after you wake up in the morning. · A tickle in your throat or coughing caused by postnasal drip. · Watery, itchy eyes. This may be allergic pinkeye. · Itchy ears, nose, and throat. · A stuffy nose, possibly with sniffing. This is the most common symptom in children. · Breathing through your mouth because your nose is blocked. · Rubbing your nose. Children tend to do this. · Eyes being sensitive to light. · Feeling tired, grumpy, or moody. · Pressure in your ear or having a hard time hearing. · Discomfort or pain in your face. · Dark circles or patches under your eyes. Other problems with symptoms similar to allergic rhinitis include upper respiratory infections, nasal defects, and inflammation not caused by an allergen. 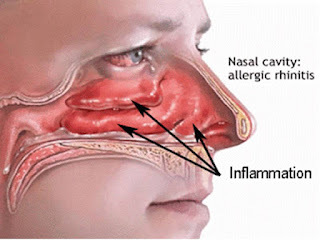 Homeopathy treatment helps for Allergic Rhinitis. And helps to prevent further recurrence also.